Dirak is one of the largest Industrial Lock supplier/manufacturer in India. We specialize in the design and manufacture of a wide range of Industrial locking systems for residential, industrial and commercial sectors of the market. Established in 1991, and it still gives us a strong family ethos and a long-term commitment to our business and our customers. We have Specific teams focused on, customer service and internal sales, Regional external sales team, Product Development Marketing, Finance, Purchasing and Credit Control Commitment to the quality of product demanded by our customers, consumers and end users. Our ownership type is a sole proprietorship. The headquarter of our company is situated in Bengaluru, India. Due to our enormous understanding and massive knowledge of this business, we are involved in the distribution of components like cable management accessories, disc Springs, Industrial Hardware Items, Feets, Spiral guard, Edge Protector, Hoses & Hose Fittings, Fire Sleeves, security seals and other Industrial Lock supplier/manufacturer in India. 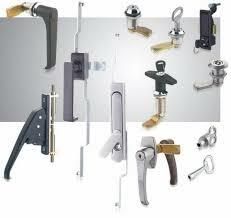 Dirak experts in Industrial Lock supplier/manufacturer in India services in everything we do. We work hard to satisfy all customer needs, all our staff is committed to doing just that!